As a teen I despised Isiah Thomas, and my stomach curled to the mention of John Starks. When the Bulls played those teams, I wanted them to dunk the opposing players into the rim. To physically bend them backwards when they scored a slam dunk. They were them, and we were us. The line was draw in the sand, and my team was on my side, and their team was on the other. That was the rules of the duel, Mano e Mano, you give us your best shot, because we plan to deliver you ours. When the game is done, the team with more points wins, and the loser, licked their wounds & used their draft picks to improve their roster for next year, and another chance to climb the mountain again, and again or until they were good enough to be crowded champion. If not you build again and see if your luck is better. 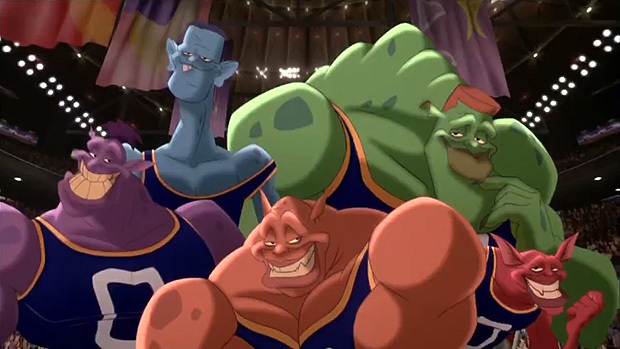 The landscape of the current NBA is fueled by fantasy, video games and reminds me of the movie MonStars. Where Michael Jordan and his team of looney tunes characters takes on a group of Aliens with NBA talent. A land of pure animated fantasy that was based on fiction. Or was it ? Could it have been the beginning of conditioning our minds to believe the road less traveled was closed, and that easy street was now an eight line highway where you can skip the tolls and head right to the finish. No traffic or road construction, just a speedy trip to your destination. Well, that looney place is where we have arrived. To a league of spoiled brats, and easy riders. If you can't win, just join forces and be crowned kings. Sure Michael had Scottie and Bird had McHale, but they were acquired as college players, not full fledged super stars. Michael wanted to destroy his competition and his competition wanted to stuff the waggling tongue back in his mouth, with a face full of humble pie. All these converging forces created a league, and for some exciting basketball. So what is next? Maybe general managers can get androids approved. They will have no need for players then or salary caps. 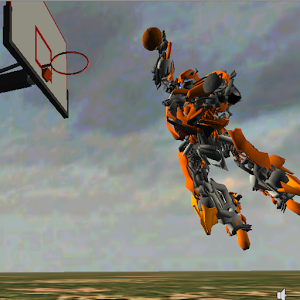 They can just build androids, like Michael Jordan 2.0. The profits would be through the roof without players, who needs them anyway right ? This summer's free agent sweepstakes includes the biggest names in the game, and Chicago has been saving their precious chips to buy them a title. But should they? Or should they take the next exit from this super highway? They could build a team the old famous way, and like the real Michael defeat the monstars, and set the NBA back on the right track. The track which made it so popular in the first place. I tend to favor the ladder. The idea of children dreaming to play as well as their sports heroes appeals to me. The thought of children seeing all the hard work and struggles it takes to become great, this has become a foreign concept these days. In life there has to be losers, because without defeat, victory has no value, no risks, no force which drives it. Phil Jackson used to say the trophy wasn't the trophy or the reward, but the journey, the journey was the reward. I agree with that concept, and feel it is the honest way to win. We all love rainbows, but without a storm they don't exist. I was one of those kids that dreamed to be like Mike, and saw all the loses he and his team suffered to become great. Now I hear the bitterness in the voices of those that suffered loses at the hands of Jordan. It is like they feel cheated, but the truth is they just weren't good enough, they just didn't reach the mountain top. Their lesson was just as important, not everyone gets a prize, yet it seems they feel they deserve a trophy for trying. It is the whole AAU culture of players teaming up with the best kids to Win. 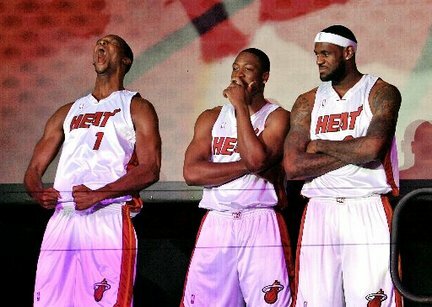 Recently, Dwayne Wade surprised me with this quote, "There's no "I" in team, but there is in win." What a beautiful thing to teach children. Was his father Reece Bobby ? "If your not first your last". So maybe the Bulls should lead this change in the NBA landscape, after all "Real men wear Red". It is a lot better than having the kids of tomorrow singing, "Sometimes I dream, that he is me, Like Mike, If I could be like mike 2.o".